This pretty little side salad comes to you as a riff on a cucumber salad I discovered at the table of my friend, Michelle Walsh. Michelle creates long ribbons of cucumber and lets them sit, briefly, in this delicious dressing, sweet with mirin and sharp from the rice wine vinegar. It is really a quick, light pickling and, with its delicate balance and gentle assertiveness, a superb accompaniment to fish. I have added radishes, because they work beautifully here and their crispness adds a different textural note. In addition to the black sesame seeds from Michelle’s original, I’ve included some fresh dill at the last minute to bring a little hit of anise to the mix. A mandoline will make very quick work of this, although the quantities – and this is enough for four people as a side dish – are completely manageable with nothing more complicated than a sharp knife. I think that 15 minutes before serving is all the sitting-around time this needs to allow the vegetables to absorb the dressing. Half an hour is fine, though I wouldn’t push it beyond that as it will start to lose its freshness and start to veer into mushy territory too much. Michelle is a genius in the kitchen – we are all not-so-secretly in awe of her skills, and especially her seafood recipes. She’s also very funny and gorgeous, too, which is verging on being unfair to the rest of us. You can see her handiwork and find her recipes at her website, MrsWalsh.com. In the bottom of your serving bowl, whisk together the mirin, rice wine vinegar and grapeseed oil. Add the sesame seeds and season to taste with a little sea salt and freshly ground black pepper. 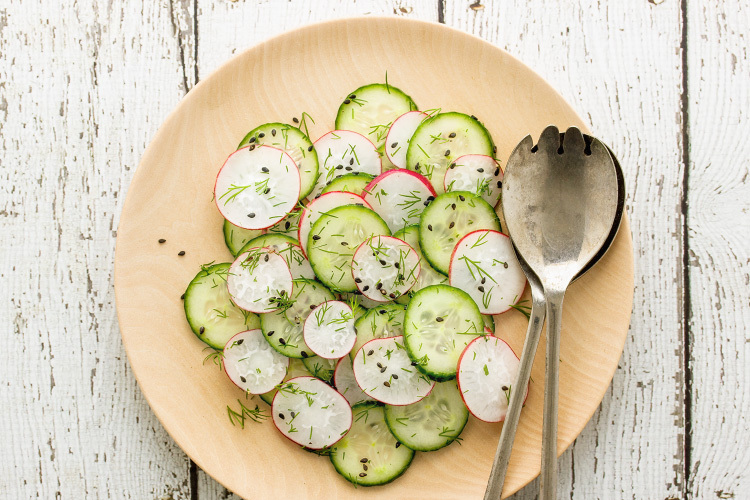 Slice the cucumber and radishes thinly and add to the dressing. Toss together gently but thoroughly to ensure the vegetables are completely coated in the dressing. Leave to marinate for 15 minutes (see note above), tossing with the fresh dill immediately before serving.